Modest Mama: Product Review: Box of I.D.E.As. Product Review: Box of I.D.E.As. Box of I.D.E.As. is a multi-level program designed to supplement your exciting curriculum or add extra enrichment to your summer learning or co-op groups. This completely portable program is designed for ages 9 to 16 and is set up pretty much like a stand-alone unit study. Each set contains many different modules for learning and also offers suggestions for further study. 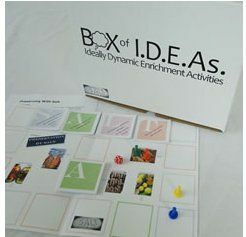 There are several different 'boxed' topics to choose from ranging from subjects like World War Two history to the importance of Pigs in our culture to quilting. Each set comes with the lesson plans and pieces for use and to construct a portfolio of student learning. Several of the units can be purchased as a PDF download for a lower cost. I was fortunate enough to receive the PDF SALT Box of I.D.E.As. This program offers a comprehensive look at how salt has shaped history, nourished our bodies, and changed our Earth. It covers subject areas in history, geography, science, language, political systems and more. The ten different learning sections are varied and offer different learning experiences. In one module your student will map out a timeline while playing a game and in another they will discover different properties of salt through science experiments. When I first received the PDF version of this program the first thing I thought was 'History Fair!' This unit study is very thorough and my thoughts on it is that it is mostly history based. James worked his way through a lesson a week and although it does touch on many different learning areas, it has a strong history focus. That was just fine with us as we are all nuts about history around here. I was really surprised to learn about all these different aspects of salt. It's fascinating! Each module contains tons of information and activities related to the topic. The files were large, so I had to be a bit picky about what I printed and what I did orally. All of the items I printed up we placed in a lapbook so that we could go back and revisit what we had studied. In general I thought this was a great addition to our homeschool learning. It would be wonderful in a co-op setting since it is so easy to use and the physical product requires very little set-up from the teacher. If your homeschooling life is hectic like mine, then I would not recommend purchasing the PDF version. Although less expensive, it requires a fair amount of work to get ready to us. I feel the experience of using Box of I.D.E.As. would have been more enjoyable and less stressful if I had received the physical product. WHAT DID MY PRODUCT TESTER THINK? Box of I.D.E.As. Salt is available at the Box of I.D.E.As. website for $79.00 for the physical product and $49.00 for the PDF download. Other crew members at The Old Schoolhouse Review Crew took a look at the Salt Unit as well as the World War Two: Pearl Harbor. You can read their reviews here, or click the banner below. Disclaimer: As a member of The Old Schoolhouse Review Crew, I received the PDF version of Box of I.D.E.As. Salt, free of charge in exchange for an honest review on this blog. I received no other compensation. We were amazed at how much info there was on salt!